AMMONNEWS - His Majesty King Abdullah and Tunisian President Beji Caid Essebsi, during talks in Tunis on Sunday, agreed on the importance of bolstering economic, trade, investment, military, agricultural, and tourism cooperation. The need to activate joint committees and increase the exchange of visits between the private and public sectors of the two countries was also stressed, in order to explore opportunities for further cooperation. Talks, attended by senior officials on both sides, covered the importance of holding the higher Jordanian-Tunisian committee’s meetings planned for next year in Amman to spearhead investment and economic partnerships while exchanging expertise. The two sides also highlighted the need to activate the outcomes of the joint committee’s decisions taken in Tunis in 2017. King Abdullah and President Essebsi agreed to maintain coordination and consultation between Jordan and Tunisia on issues of mutual concern, in service of the interests of the two countries and peoples. His Majesty affirmed Jordan’s keenness to ensure the success of the upcoming Arab Summit to be hosted by Tunisia next month, with the goal of enhancing joint Arab action. 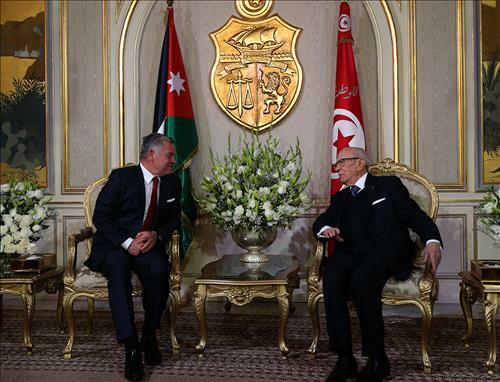 The King and President Essebsi discussed regional developments, foremost of which is the Palestinian cause. The two sides stressed the importance of stepping up international peace efforts to end the Palestinian-Israeli conflict on the basis of the two-state solution and the Arab Peace Initiative, and in fulfilment of the legitimate aspirations of the Palestinian people for an independent state on the 4 June 1967 lines with East Jerusalem as its capital. Discussing the Syrian crisis, the two sides called for a political solution that safeguards Syria’s territorial integrity and the unity of its people. The talks covered a number of regional crises, as well as efforts to fight terrorism within a holistic approach. President Essebsi and his spouse also hosted a luncheon in honour of His Majesty and Her Majesty Queen Rania Al Abdullah, as well as the accompanying delegation.